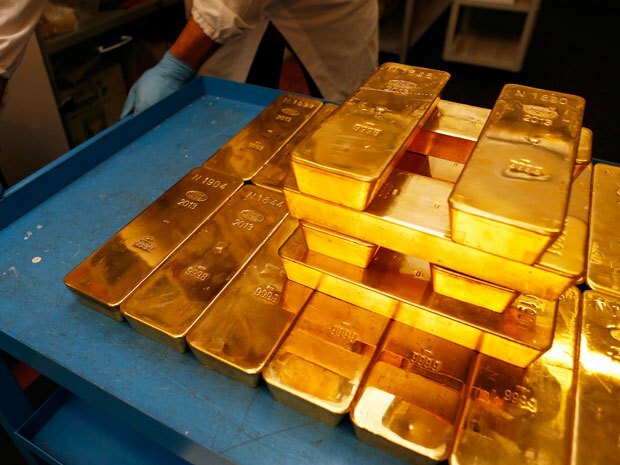 JNN 26 Dec 2013 CHICAGO – Gold futures on the COMEX division of the New York Mercantile Exchange Monday fell below 1,200 dollars per ounce on upbeat economic data. The most active gold contract for February delivery fell 6.7 dollars, or 0.56 percent, to settle at 1,197 dollars per ounce. Data released by U.S. Commerce Department Monday showed that the consumer spending rose a seasonally adjusted 0.5 percent in November, the fastest pace since June, and the personal income rose 0.2 percent, putting gold under pressure. Meanwhile, the final December reading of the University of Michigan-Thomson Reuters consumer-sentiment index hit 82.5, the highest level since July. 2013 was certainly a disappointing year for gold, market analysts hold. Though there was continuous support from physical demand, gold still seemed to be overvalued. Societe Generale even predicted that gold’s safe-haven role is over, as the Federal Reserve said last week it would start scaling back its bond-buying program. ? ?Silver for March delivery lost 4 cents, or 0.21 percent, to close at 19.413 dollars per ounce. Platinum for January delivery slipped 4.8 dollars, or 0.36 percent, to close at 1,327.4 dollars per ounce. Gold is a “classic bubble” and could go all the way down to $500 an ounce, Fortress Investment’s Michael Novogratz said on CNBC Wednesday. Gold prices have dropped 27 percent from those lofty levels—plunging through $1,400 in mid-April for the first time since early 2011. Despite moving above that key level for a while since then, prices were trading around $1,393 midday Wednesday. “It wouldn’t shock me to see gold back at $500,” he said. Novogratz also talked about the stock market—saying it could drop 10 to 15 percent when the Federal Reserve begins to pullback on its bond-buying program. But that won’t happen for a while and stocks should continue to rise in the meantime, he added. The Gold Prices about 2 years Back , in around Sept’ 2011 ,have reached the Highest ever of USD1900.00 , but since then they could not attain their Position ,as the World Economic Situation , and the Recession has Made the World Leading Nations into Cutting on their Investment and rather have to switch to austerity Measures due to the Economic Crunch , and for this reasons the Nations like Cyprus , Ireland , Spain, Italy, Greece are now on the Verge of Economic Melt down , and thus there Gold reserve are under tremendous Pressure , So Instead of Buying , rather these and other Industialized Nations are Behind the curtain selling their gold reserves , and thus the Gold Prices are since then under High Pressure and are likely to come to its Base Prices , which is about USD450.00 , about 6 years Back. This entry was posted in Jafria and tagged Federal Reserve, Federal Reserve System, Gold as an investment, gold futures, gold prices, Gold reserve, June, Michael Novogratz, New York Mercantile Exchange, Societe Generale, Squawk Box, University of Michigan-Thomson Reuters. Bookmark the permalink.